Findings of a Pew Research Center Survey have revealed that 75% of Ghanaians would go to live in another country, if they had the means and opportunity. The research titled: At Least a Million Sub-Saharan Africans Moved to Europe Since 2010 was published on March 22 and showed that four-in-ten Ghanaians want to leave the country. 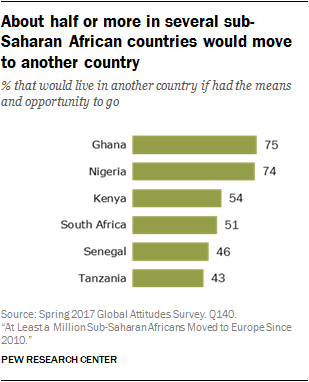 It also found that 42% of Ghanaians plan on moving to another country in the next five years. “Among the six countries polled, the share with plans to migrate ranges from roughly four-in-ten or more in Senegal (44%), Ghana (42%) and Nigeria (38%) to fewer than one-in-ten in Tanzania (8%),” the research found. “Will all those with plans to migrate in fact leave their home countries in the next five years? If recent history is a guide, the answer would most likely be no. But data from official sources suggest that this will not be for lack of effort”. The survey asked respondents whether they would go to live in another country if they had the means and opportunity. At least four-in-ten people in sub-Saharan countries including; Ghana, Nigeria, Senegal and Kenya replied that they would jump at the opportunity. However, three-quarters of those surveyed in Ghana and Nigeria answered yes with 75% and 74% respectively. “The relatively high shares of people in these countries who say they would resettle in another country is generally consistent with findings from other surveys, like Afrobarometer in Nigeria and Ghana, that pose questions about the desirability of migrating. Compared with other world regions, Gallup polls find that sub-Saharan countries have some of the highest shares of people who say they would move to another country,” the research stated. “What’s behind the widespread appeal of migrating in some sub-Saharan countries? Multiple factors could be at play. To begin with, while many sub-Saharan African economies are growing, many countries continue to have high unemployment rates and relatively low wage rates. In addition, the job market looks unlikely to improve anytime soon, thanks to high fertility levels that will mean even more people competing for jobs. Against this backdrop, sub-Saharan Africans could see migrating to countries with more – and better paying – jobs as a means of improving their personal economic prospects”. Results of the survey were based on face-to-face interviews conducted under the direction of ORB International. The Pew Research Center is a nonpartisan fact tank that informs the public about the issues, attitudes and trends shaping the world. It conducts public opinion polling, demographic research, media content analysis and other empirical social science research.